Mrs. Cassidy slowly walks into my office one busy afternoon. I see her out of the corner of my eye because she is hard to miss. Mrs. Cassidy has some serious style. She has a deep orange dress with a bright blue blazer on. There aren’t too many folks that can pull that outfit off, but she can. She has a wide slow smile, and she speaks with a slow southern drawl that belies her southern roots. This was supposed to be a routine follow up visit for a 67 year old woman with a history of a mechanical mitral valve replacement and coronary disease. Unfortunately, she tells me a story that is concerning for angina. I think she needs a stress test. I slide over to the insurance tab on the EMR and I let out a somewhat audible groan. She has a Medicare Advantage (MA) plan. I explain to Mrs. Cassidy that we will need to go through an extra step to pre-certify her stress test. She expresses surprise and asks me what she should do. I will tell you what I told her, but first, let me tell you why. The concept of receiving medicare benefits through private health plans has existed since the 1970’s, providing an alternative to traditional fee for service (FFS) Medicare. The federal government pays private insurance companies a capitated amount per enrollee, with the idea that the private market would be more cost effective than traditional Medicare. Prior to the Balance Budget Act (BBA) of 1997, Medicare paid 95% of average traditional Medicare costs to private plans. The idea behind lower payments seemed sound. Managed care had more flexibility with paying providers (i.e. using gatekeepers, demanding prior authorizations for tests, etc. ), and managed care patients were in general healthier. Under these rules however, the private market was a relatively small slice of the total Medicare pie covering only 13% of all Medicare enrollees. The year everything changed was 2003. The Medicare Prescription Drug, Improvement, and Modernization Act (MMA) is best known for introducing prescription drug coverage to medicare patients (Medicare Part D). Less well known is the provisions within the bill to provide a major increase in government contributions to private (Medicare Advantage) plans. As a result Medicare now pays more for private plans per enrollee (~$1,000) than the cost of care for beneficiaries in traditional medicare. In 2014 payments to MA plans totaled ~$159 billion. 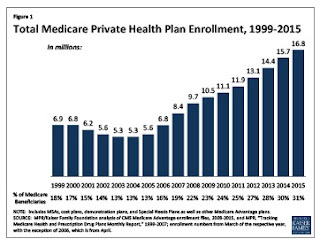 Not surprisingly, enrollment in MA plans has exploded since 2003. 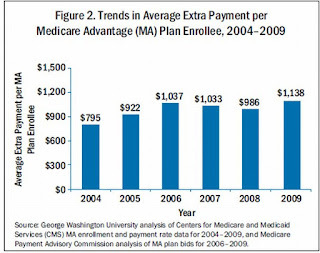 MA plans went from enrolling 13% of medicare beneficiaries in 2003 to 30% of beneficiaries in 2014. To be fair, much of this extra payment is mandated to be used as benefits for MA enrollees. This can take the form of extra benefits to plan members or premium relief. This still sets up a payment scheme that favors those enrolling in MA. Sign up for an Advantage Plan! Get free stuff that the 70% of folks enrolled in traditional medicare will pay for! The current mantra about cost in health care places a large portion of blame on a fee for service culture. You will find little argument from me that paying per unit of healthcare delivered will result in a lot of health care being delivered. However, the prevailing ideology that states bundled payment models will be cost effective is more faith based than evidence based. The history of payment to MA plans is quite instructive in this regard. The idea of capitated payments to private insurers started as an attempt to cut costs. Capitated payments, however, encourage insurers to enroll a lower cost, healthier enrollee, and not surprisingly, that is exactly what insurance companies have done, and continue to do. Offering free gym memberships (Silver Sneakers) is very nice, but it also does tend to attract beneficiaries that can go to a gym and workout. The end result is that the federal government pays more for MA enrollees relative to their costs in traditional Medicare. The solution seemed clear. In 2004, the Medicare program began to tie payments to private plans to beneficiary risk score. Medicare calculates payments to plans separately for each beneficiary, multiplying the the plan’s payment rate by the beneficiary’s risk score. Risk scores are based on diagnoses coded during the year prior to the payment year. Insurance companies responded by investing resources in ‘ensuring’ ‘appropriate’ coding. The appropriately titled “Upcoding: Evidence from Medicare on Squishy Risk Adjustment” by the National Bureau Of Economic Research (NBER) found that a 10% increase in MA market penetration lead to a 0.64 percentage point increase in the average risk score in a county. MA plans generate risk scores for their enrollees that is on average 6.4% higher than what those same enrollees would have generated under traditional Medicare. Moreover, consumers choosing traditional Medicare have similar risk scores and diagnoses in their employer plans at age 64 and in traditional Medicare at age 65, but consumers choosing MA show a boost in risk scores and diagnoses the year after their transition. Who would have imagined it? Simply enrolling in a MA plan makes you higher risk. The other nostrum to cure all ills of the current health care system proselytized by fast talking policy makers, and politicians are value based payments. Once again, the MA experience provide lessons aplenty. Measuring value: Harder than it sounds. Quality in the MA program is graded on a 5 star scale that is determined from a weighted scale comprised of variables that include adherence to best practice processes (Adults should get flushots) and outcomes (Diabetics should have blood pressures < 130/80). These specific parameters come from the 2010 MEDPAC report on comparing quality in medicare plans. The problems are readily obvious. 2010 was also the same year that the ACCORD trial examining aggressive blood pressure targets in diabetics was released: Targeting a systolic blood pressure target of < 120mmHg compared to < 140mmHg did not reduce the composite endpoint of fatal/non fatal cardiovascular events. The world of hypertension was so spooked by this trial that the panel convened to create a national guideline used this trial as evidence that lower was not always better when it came to blood pressure lowering. That was until Nov 2015, when the SPRINT trial (that excluded diabetics) but included patients at high risk of cardiac events, did show a mortality benefit of targeting systolic blood pressures less than 120. So it is entirely possible that in 2010, plans were incentivized to do harm to diabetic patients by having lower blood pressure targets. Mired in this quicksand of higher cost, who-knows-what-value care, there was no damsel in greater need of being rescued than the health care system. Riding to the rescue was the Affordable Care Act (ACA). Unfortunately, the ACA has proved so far to be more Don Quixote than Sir Lancelot. The ACA sought to balance the scales by reducing the extra payments to MA plans. The idea was to stop overpaying certain parties, and use the money saved to help pay for provisions of the ACA. This, seemingly reasonably course of action has been fairly bumpy. In 2014 and 2015, CMS announced that medicare advantage payments were set to rise for the following years. This reversed a decline proposed earlier in the year, and came after a major lobbying effort from the health insurance industry, as well as members of both political parties. So much for Sir Lancelot. In brief, the federal government’s experiment in risk adjusted, value based payments to private insurance companies has been a failure. It has only served to shift health care dollars to insurance companies at increased cost to the taxpayer. Our senior citizens, do, happily have more ‘free’ gym memberships as a result. Adding insult to injury the same insurance companies being paid more for each enrollee increase the degree of difficulty for physicians trying to take care of their patients. Today, my staff has to spend time pre-certifying a test; tomorrow promises to be an even greater time-sink as payers demand even greater reporting of practice demographic and outcome data. One would think, the people in charge would have learned lessons from the MA misadventures. After wading through meaningful use stages, PQRS initiatives, and queries from clinical documentation specialists about what type of respiratory failure my patient had, I can most definitely say: They have not. Between January 1st and February 14th each year, if you are enrolling in Medicare Advantage plan, you can leave your plan and return to original Medicare. John F Kennedy famously said, “Ask not what your country can do for you, Ask what you can do for your country”. Mrs. Cassidy, do what’s right for your country. Choose traditional Medicare. Dr. Koka — I am sympathetic to your arguments. However, you acknowledge that FFS does not work either. Our healthcare system is way too expensive, and we cannot afford it. What is your proposal to reduce the cost of healthcare in the US? When I become eligible for Medicare in about 7 years, I would be much happier to pay for my own gym membership and have my more expensive testing and treatments covered. It is complex. I had a conversation with a good friend who is a Pcp who told me that extra ma payments to the practice were a lifeline.. While I sympathize, it still doesn’t change the fact that MA plans at a macro level are more expensive. No easy path out of this mess.